This may be the longest blog post EVER! 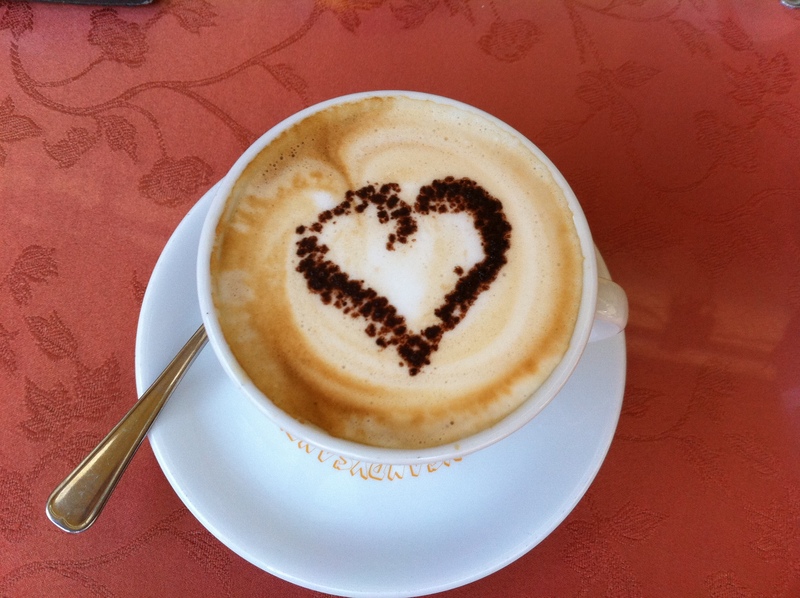 I post it this holiday week, so you can sit back with a cappuccino and enjoy a journey to a kitchen in Italy. Being from my journal during our recent trip, it is not a lesson, but an experience. 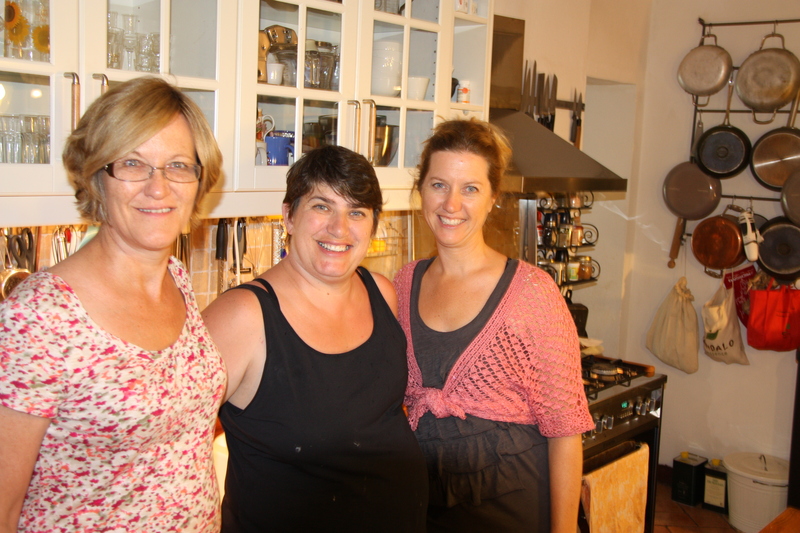 I hope one day you too can enjoy an Italian Cucina cooking class ! Because in my original email Alessandra had indicated she was available July 29th, and I had to correct her to June 29th, I was a bit afraid I had the wrong day, even if at the right place. I was five minutes early. Her store, Il Girasole(The Sunflower), which was under the theatre, was still boarded up like a storage bin. I found a quiet place in the shade to wait, watching the street full of Italians and foreigners of all languages. Soon, a Jeep pulled up and a shorthaired woman in her late forties walked toward the garage featuring the Il Girasole sign. She hefted the large green barricade and hid it away into the ceiling, revealing an adorable shop of table linens. “Alessandra?” I asked from behind. I laugh at how although I speak English as my only language, somehow while speaking to foreigners, I tend to chop it up as if I am only allowed nouns and hand gestures. “Me: Terri” (pointing to me). “You: Alessandra” (pointing to her). “Cooking class?” and I stir an imaginary pot. It was the most American English I had heard from a native. “Wanna” was such casual slang. “You drive a Jeep?” I asked, surprised by the American car, but sharing a love for her particular choice. I am not sure what I had expected: more prim? More fashionable? I don’t know, but I was feeling silly that I had fretted over what to wear, or if I should have smoothed my hair and whether I would be offending someone if I turned down wine. But Alessandra was real. I knew immediately I would like her, but wasn’t sure if she’d like me. She got out her laptop and busily printed color photo-quality recipe books and information packets for the day’s class. I was amused by the irony of my iPhone and her photo printer in the middle of Cortona, which, as one of the oldest hilltop towns of Tuscany, rivaled Sienna and Arezzo during the Middle Ages. The next class members walked in, and an “attitude-full” pre-teenager was ambiance changing. The mother who was in her fifties, beside her two daughters, age 13 and 12, hurriedly explained that the reason they were late was the “trafficko” in the mountains was horrible – as if adding an “o” to a very American pronunciation of a word made it Italian – and as if someone had asked her why they were late. The newcomer went on to explain that she had been coming to Italy for 20 years and had bought a villa, or two or three on the other side of “the mountain,” – as if someone had asked. Pride is unattractive in all its forms. I’m afraid my annoyance may have been equally unattractive, so I attempted to hide it. The 12-year-old stood with one hip jutted and arms crossed, as if someone had better prove to her soon that today was worth her time. When Alessandra spoke to the girls, the younger’s position and tone didn’t change – showing the lack of respect that can make everyone within the room cringe. I suppose it wasn’t an option to leave the younger at home, when the older clearly had more of an interest in cooking. Alessandra went back to her computer while I browsed the hundreds of tablecloths and cloth napkins. So beautiful! Yet they were so unpractical, because my four children would stain them within one meal. They were true linens – the kind you hand wash in cold water and line dry for three minutes before ironing to dry the rest of the way. I owned four placemats like these once but ruined them in their first and only meal and have lived with plastic ones, no tablecloth, ever since. “Alessandra!” a man said as in full recognition of his old friend as he and his wife entered the store with beaming smiles. She left the computer and went to receive her guests with a kiss on each cheek. Randy and Brenda completed our set of six students, and they blew into the room with a fresh ray of sunshine that broke through the pollution that had hung there moments before. Based on that excited greeting, I asked Randy when he had met her or taken the class before; he said he had never met Alessandra; he was just excited to be there. How refreshing and contagious is enthusiasm, I thought. We walked from Il Girasole to the coffee shop across the town square. Alessandra told us to go inside and pick out a pastry, then come outside and order a “caffe’” or whatever we preferred. I picked something that looked scrumptious, and even more so as the tongs compressed it nearly 50% when the baker picked it out of the display case. The sugar crystals made the whole surface shimmer and my mouth water like Pavlov’s dogs. We went to the table and ordered five cappuccini – with one hot chocolate – and one “coffee, as cold as you can get it,” for Alessandra, who began to tell us all about Italian cuisine and herself. She started by saying she didn’t care what anyone thought of her and the saying that “the customer is always right” is only true in America. I liked her more and more. The man brought our drinks. My cappuccino had a heart drawn with cocoa powder on top of the milk froth – consistent with the art that was behind all of their food, as I was beginning to notice. Alessandra went on to explain that milk in Italy is a food, not a drink, so Italians don’t order cappuccino with food, but as food. Espresso (or Italian coffee) more likely accompanies food, as in dessert, but is usually “thrown back” as a shot of whisky, not sipped like we Americans do. In her science and art of coffee, she helpfully explained that Italian coffee has less caffeine than American because of its fast brew time and low volume. I was amused with the confidence in her statement, as if she had just completed her degree to be a dietician, and her thesis was on “caffeine consumption comparisons.” I grinned despite myself and socked away all this new coffee truth. She continued to elaborate as we intently listened, notebooks emerging from purses. “Pelegrino Artusa was the original cook in Italy and responsible for the cuisine’s fame.” I was surprised and encouraged when I learned that Italian cooking was truly simple, made from few ingredients. “I laugh when I find recipes online, claiming to be Italian, yet they have so many ingredients! Obviously made up by a foreigner!” she said, as she told us that pasta had three ingredients, bread four, and as we would see later today, tiramisu had five. We rose to start our day of Italian cooking – beginning with shopping. At home, my shopping for our family of six involves an approximately two-and-a-half hour escapade once a week. I fill almost two carts and pay about $400. There are some fresh items that last maybe two or three days, and then we live from the apples, bananas and the pantry or freezer for the other four days. Italy grocery shopping was completely different. Chris even went to the grocery store here! I can count on my fingers the number of times he has done that during our marriage, but this was the first time he had ever gone without a list from me, since he had been out on his motorcycle alone. He came home so triumphant and proud. It was as if he had killed a bison with his bare hands – making cheese from the milk; slaying it for its leather; carving knives from its bones; filling its bladder with drinking water, and cutting meat from it for a year of family provision. Of course, he came home with about a day’s worth of groceries, but that does feel like quite a victory when battling a crowd of a different language and customs. Apart from the difficulty of reading the ingredients made necessary due to Nathaniel’s food allergies, there’s the fact that you weigh your own fruit and vegetables and label it with a sticker – preferably before you enter the checkout line with ten people behind you. Also, here you must estimate how many sacks you will need, because you have to purchase them while you are buying your items. Families are small here, so quantities are too. Milk comes in one-liter bottles, and is almost always the shelf-stable variety to save refrigeration costs in the store. Chicken breast comes four filets to the quarter-pound. More common meats are wild boar, any part of a pig in sausage or prosciutto, and rabbit. Of course, Alessandra was shedding light as to why we, the foreigners, were the only ones in the supermarket who actually rented a cart (you have to temporarily pay one Euro to use one) and bought bags. Everyone else must do their shopping almost daily as she was showing us. “Italians like to buy everything fresh daily, and ‘make do’ with what’s available,” she said as we walked down the cobble streets of Cortona in an ensemble of seven. The old town seemed so alive with people. 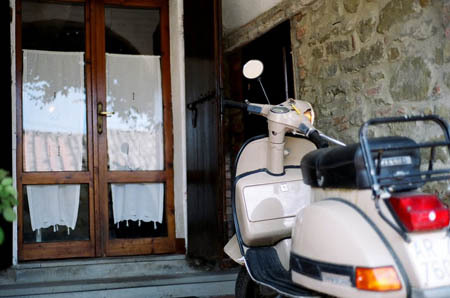 I had been to Cortona before, but as a tourist seeing everything for sale as a “trap” for us. This time was different. I was walking with a native Italian who said “hi” to her friends and gave to the beggars whom she seemed to know by name. They didn’t ask her, just expected. We were buying fruit, vegetables and meat from the frutteria and the butcher shop within the old city, not the supermarket down in the newer part of town where our family had been going. These stores, by which I had walked so many times when we toured these old towns, now had personality and purpose, as I saw the way the locals convene there. The outside front of the frutteria was laden with familiar fruits and some not so familiar. Alessandra warned us that the storeowners prefer to do the fruit touching, so I supposed I would not be taste-testing the grapes that seemed to be calling my name. We entered through a narrow door for a skinny person, down three stairs to the real store, as the storeowner put some fruit in a bag for the beggar. The store was lined floor-to-ceiling with trays of fruits and vegetables, and the stench was such a combination I could not identify one ingredient. Alessandra said aloud her list and the worker busily went from basket to basket, gathering. No refrigerator doors were there to slow her down. What? No zucchini flowers? What would we do? I had never heard of a use for them, so I didn’t know what she was planning anyway. Despite that, I didn’t trust my Italian enough to know if we were really disappointed that she had no zucchini flowers. “…sette fico…” Seven Figs?! Oh! Just the sight of the figs made my heart skip! I had been introduced to them in Maori, when the fruit shop owner was shocked that I had asked what they were. “Fico?! You don’t know fico? !” He seemed appalled as he broke one open with his thumbs and insisted my daughter and I try a bite. There was no charge – as if his only payment was watching our enjoyment at such a wonderful, new taste. I had had figs in the States before, but they were classified more as weapons than fruit. These figs were amazing, almost dissolving in our mouths with no chewing required. I wondered what we would be doing with figs today during our time in Alessandra’s Italian Cucina. Next, we went to the butcher shop. I have seen a couple of these in every old hilltop town we have visited across the Tuscan countryside. Large legs of cured meat are strung from the ceiling and walls. It had not dawned on me until this moment that clearly these shops were not the tourist traps I had labeled them. I had never seen a tourist carrying an animal’s cured leg (or shoulder, as ours turned out to be) while walking down the street behind a tour guide. The shops were real, active suppliers of fresh foods for the locals. After greeting her friend the butcher, Alessandra explained to us that all of the meat was labeled due to law, with the serial number of the animal, the farm from which it came, and the day and hour when it was killed. The label was proudly displayed inside the glass case, or hanging on the hook with its meat. There was chicken – whole ones, not the thin filets of the grocery store, and also goose, ostrich, prosciutto – hind quarter or shoulder, sausages, rabbit and various cuts of beef – all with the serial number and dates attached to ensure freshness. The sausages have come to be a local favorite of mine – a flavor I haven’t had in the states, yet they lack the processing and preservatives for which sausage is infamous at home. We bought an eye of round beef for the stove top roast and some chicken and beef to mince for our olive meatballs and ragu’. We took our purchases, along with some others (flours, etc) that Alessandra had bought elsewhere and headed to the taxi waiting for us at Il Girasole. We drove ten minutes to arrive at her home, a humble abode on a bumpy road amid a cluster of similar two-story “typical” country homes with large wood shutters. Walking in, I was struck by the air-conditioned air, which was a treat given that the temperature outside was reaching into the high 90’s F.
The front door opened into a marble-top dining table with a well-organized kitchen and preparation island behind it. A couch and television to the right made the family room and the kitchen into a rectangle. The stairs left of the table led to the only bathroom and three bedrooms upstairs. The door beside the stove in the back right led out to the garden, with a garden shed and an outside dining area for cooler days than this. Although a small home (perhaps 1300 square feet) by American standards, the only hallway closet visible was filled with table linens. The family room was lined with shelves of books and a shelf of DVD’s – from which our pre-teen student selected Harry Potter when she was “tired of cooking” at 12:30. 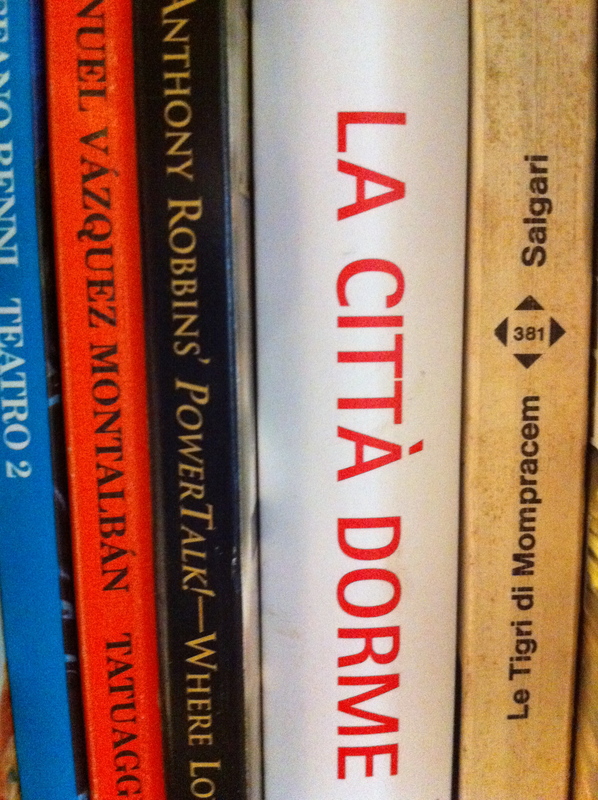 It amused me to see John Grisham and Anthony Robbins in their Italian form on her bookshelves, but explained a bit of her evident American intellect. Alessandra’s husband, 13-yr-old son, and 9-yr-old daughter stayed outside for the majority of our eight-hour home takeover. I hope she left them some food! 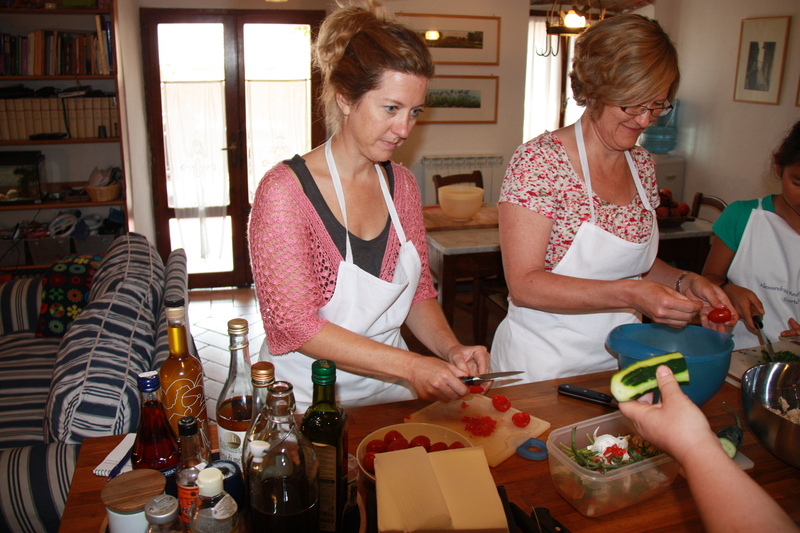 We began our cooking as I presume most cooks do – with chopping. Celery, carrots and onions were chopped, or at least prepared for the food processor. I felt smug because the night before (without any Italian cooking class) I had stir-fried celery, carrots, onions and zucchini, then tossed them with basil, tomatoes, and extra virgin olive oil in pasta for the family. Maybe I wasn’t that far off of becoming an authentic Italian cook. Maybe I was a natural. “Italians never stir-fry,” Alessandra began, as if reading my mind and zapping my obnoxious pride. Soffrito, as she called the three-vegetable combination, is cooked slowly in olive oil so it gets flavorful, but never brown. 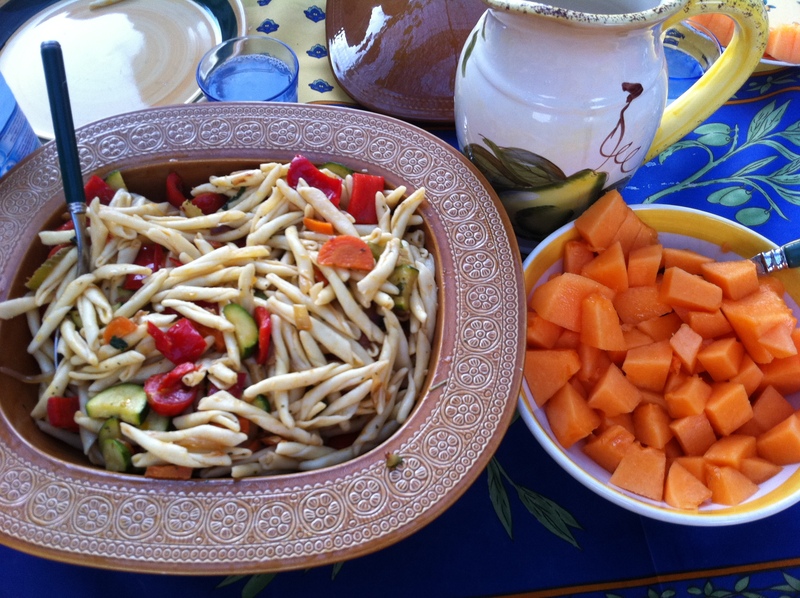 I smiled, inwardly remembering how my browned vegetables had colored the whole pasta the night before. We would be using the soffrito for the Polpettine di olive (olive- flavored meatballs), as well as the ragu’ , which literally translates as “stew,” although they serve it on top of pasta. She said it would cook slowly, unattended, for forty-five minutes before we would even add anything else. In the mean time we put her week’s worth of stale bread in a bowl full of water to soak in preparation for panzanella. This salad – which is layers of bread and vegetables with herbs and oils on the top – would traditionally be carried to the farm fields or picnics, and tossed upon its arrival. 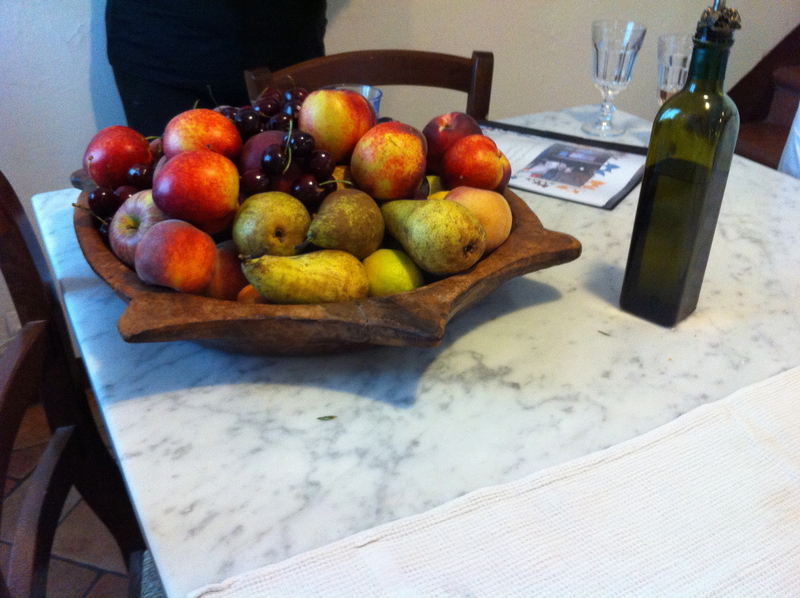 Next, we went to the marble table where a large wooden board and a flat plastic spatula-type tool awaited us. Alessandra took out a large container of semolina flour and dumped four medium scoops onto the board. We separated it to make a hole in the center like a large volcano. Being the only male, Randy would be the center of much attention today, and he was chosen to begin the pasta making. He cracked four eggs into the center of the mound, added some olive oil and began mixing the ingredients, using the flat tool to keep the liquid from escaping. “Have you ever kneaded?” Alessandra asked. “Only love, here and there,” Randy replied. Alessandra rolled her eyes, said, “Mama mia!” and then continued in Italian some words of pity toward Randy’s wife, Brenda. He kneaded it into a soft ball, and Alessandra added more flour pronouncing the dough “too soft. Pasta dough must be stiff.” The newly stiff ball was then plopped into lightly covered bowl to sit for hours while we continued the rest of the meal preparations. With permission granted we headed into the barnyard. The yard, which had more gravel than grass, contained chickens, ducks, geese and various coops of babies lining the borders. 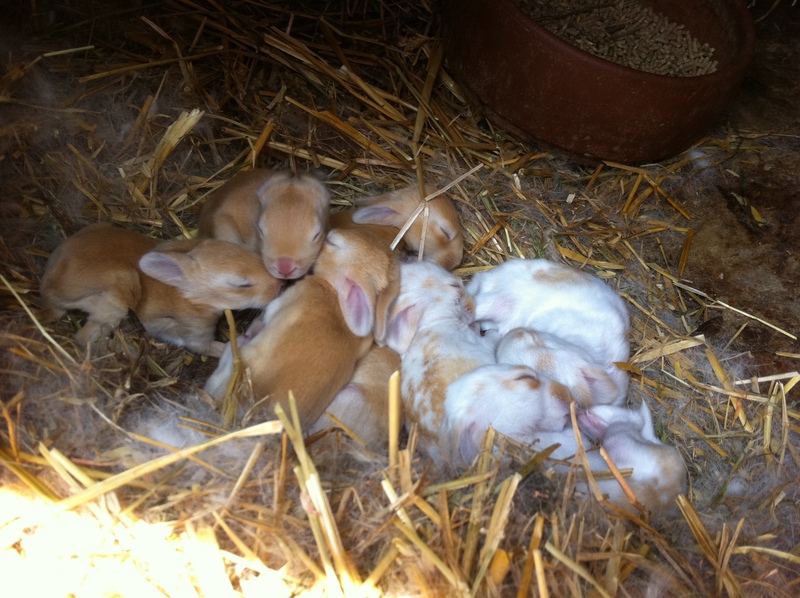 Bunnies had been born two days before, but Alessandra corrected us: “These are not bunnies; these are rabbits,” meaning they are food, not pets. Alessandra grabbed five eggs from the nests – perfect for the tiramisu that would use raw eggs, so the fresh ones were required. She helped herself to several twigs from the rosemary bush (for the roast beef) and sage leaves for us to fry. The new smells and concepts had my tongue curious. Back at her home we minced the chicken and added it, sausage, and ground beef to the soffrito for the olive balls. As I chopped the chicken, I was grateful for the sharp knife – one of the 20 attached to her wall on the magnetic strip – since I had been forced to cut with a butter knife all week at our rental villa. The knives were not the only utensils on display. Pots hung on hooks on a grid attached to the far wall. A canister displayed various ladles and pasta forks. A drawer contained fifteen matching spice containers with labeled lids. Another held matching containers of grain: Spelt, all-purpose-flour, salt, sugar and semolina were the only ones I recognized. 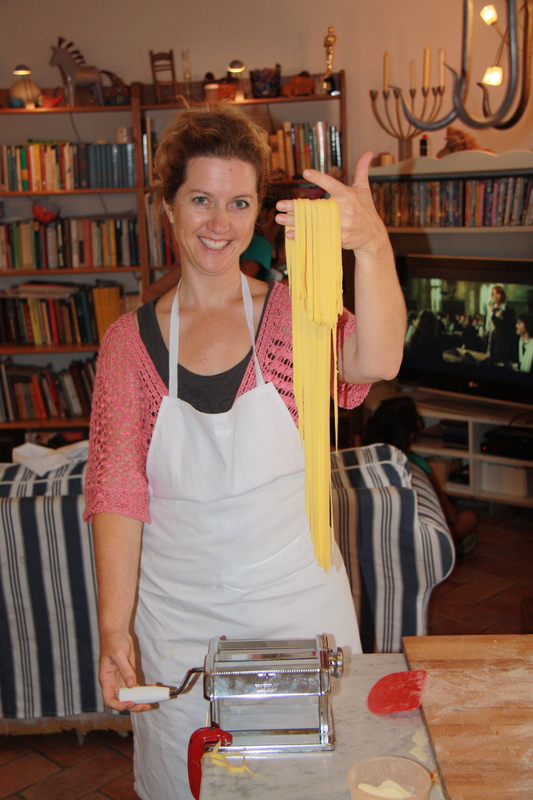 We took turns with the pasta machine – pressing it to thin, then cutting into tagliatelle strips. Alessandra told us it could be done with a rolling pin, but she had never figured out how, much to the dismay of her neighbors whose average age was eighty. Our cooking day continued: batter to fry the sage leaves and zucchini flowers, a ceramic knife (which I had never heard of) to cut the apples into thin slices to lay with cheese and honey; rolling and frying of meatballs (never served on spaghetti, by the way), assembling of the wet-bread salad; adding wine (which would of course burn off) to the ragu’ and the “drowning” roast beef with rosemary. When deep-frying, the oil got too hot and almost caught fire. “I’m estupido,” Randy joked in Americano-Italian. “You are not stupid, just dangerous!” quipped Alessandra in return as she threw out the half-liter of burned olive oil and started anew. No flour was added to thicken the “jus” for roast beef; the sauce was just left simmering while we started eating our antipasti. No sugar was added to take the acidity out of the sauce, because the length of cooking had created the perfect flavor. “Americans rush cooking too much and then have to add helps to try to fix the problems they’ve created,” Alessandra educated, with the authority of her whole country behind her. As a working mother, she had no more hours in a day than we did, but she explained how she cooked ragu’ during and after dinner, then took it off and put it in the fridge for the next night’s meal. To my surprise the herbs (rosemary, garlic, etc) were removed from the dishes before we ate. Their flavor remained where it was supposed to – in the sauces. Too hot to eat outside, we set the linen inside for dining at the marble table. 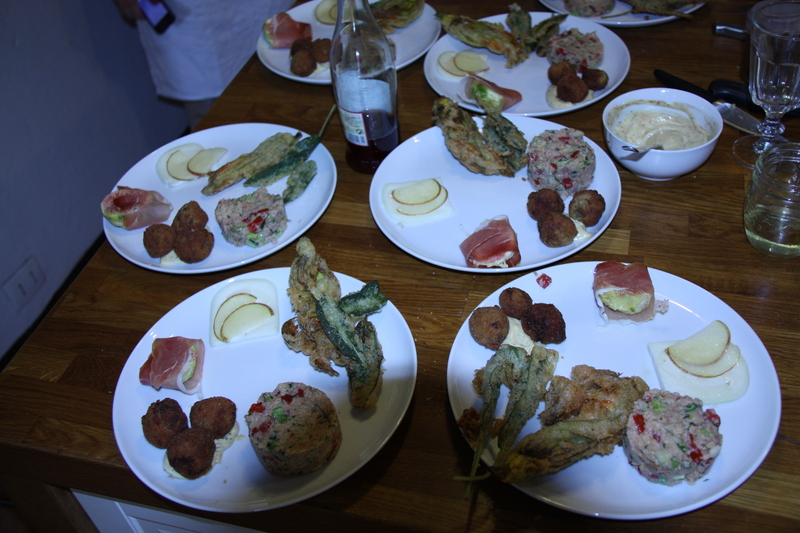 We lined up seven plates on the island to “decorate” each one with the six antipasti we had created. As we took our plates to the table, Alessandra put on a big pot of water to begin boiling. It was five o’clock, the scheduled end of the class, but we would “make do” and happily continue. Chris had texted me to “Stay as long as you like,” so I sat to enjoy conversation and food with new friends. The wine was opened, and after Alessandra turned it down, too, I knew my own refusal would not offend. After antipasti (of which I devoured every bite), we cooked and drained the homemade tagliatelle, never rinsing so the porous pasta would soak up the ragu’, not the water. We tossed it with the sauce, then one more ladle on top before serving with cheese, never bread. Delizioso! 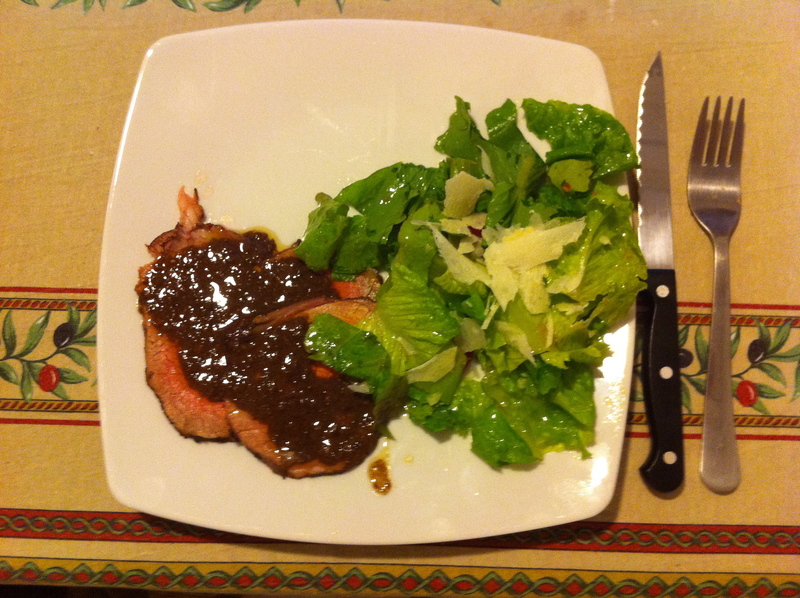 We went on to the beef, thinly sliced (Carpaccio) topped with the cooked-down sauce beside a simple salad, dressed with oil and apple vinegar. The entire meal came from local ground within a few miles of the table. This is how food was meant to be, I thought, savoring every mouthful. The meal was completed with our five-ingredient tiramisu and caffé. Yum! Grappa was served, supposedly to “aid digestion,” but that shot is so strong I think it only burns the calories before they digest, and burns the stomach lining too! It was more than two hours past our ending time, as we enjoyed company and let a storm roll through. I think the day was truly perfetto, and when this customer is right, I’m right. Brenda, Alessandra and I finito! This entry was posted in Sister to Sister, Travel by Terri. Bookmark the permalink. I could smell the rosemary and herbs while I was reading. Your words made me feel like I was there. Thank you for sharing. Happy Thanksgiving. Terri what a wonderful time you had and everything sounded so deliciouso! I enjoy your blogs so much, but this one was really special. Thank you. Reading all the posts by you and Chris about Italy has really expanded my dream and vision. Italy is definitely toward the top of my travel list! Thank you for sharing all of your experiences. Your writing is beautiful and you do an amazing job creating vivid images for your readers! OH good!! I think Chris is planning on using it in a future book he is writing now:) Thanks for your encouragement! Thank you, Terri, for such a wonderfully worded post. I enjoyed reading every minute of this because it stimulated the different senses… and my elephant was charging! I love everything you wrote, the place, the language, Alessandra, the small streets, the market teeming with local producers, the cuisine and the culture that goes around it, the cooking, the eating… can you guess I’m a melancholy? All these details were a treat to my elephant! I can read this over and over until that time when I will actually experience it! Thank you for this great dream builder! Btw, you should also write a book about dream building around your day to day experiences as you travel with Chris and the children! I’m sure it will become a home-runner! Great job! I can feel the pasta and smell the onions on your hands. I also smell the herbs and burnt olive oil, but most of all I felt your love for cooking and sharing with us so that we too can dream a little bigger. WOW!!!! Thank you for bringing a “taste” of Italy back to us! I have alwasy wanted to visit and Josh and I plan to do so very soon! Thank you Terri for such a descriptive story of your cooking class. My biggest dream is to own a Tuscan Villa w/ a working vineyard, olive grove & barn w/ lots of animals for my grands. Tiramasu is my favorite dessert w/ creme brule second.This story captivated my senses on every level!! Most of all…..it captured my heart & intensified my love for Italy! Bella Terri! Thank you for that incredible culinary, cultural delight!! I LOVE the way you painted the picture of your day with Alessandra. You have such a GIFT for writing!! Bon Appetit! It’s a real compliment to you that my mouth is watering – time to get lunch!) Love you Terri!